Appeal to Reason was founded by Julius Wayland in 1897. The socialist journal was a mixture of articles and extracts from radical books by people such as Tom Paine, Karl Marx, Friedrich Engels, John Ruskin, William Morris, Laurence Gronlund and Edward Bellamy. Julius Wayland moved to Girard, Kansas, and in 1900 employed Fred Warren as his co-editor. Warren was a well-known figure on the left and managed to persuade some of America's leading progressives to contribute to the journal. This included Jack London, Mary 'Mother' Jones, Upton Sinclair, Kate Richards O'Hare, Scott Nearing, Joe Haaglund Hill, Ralph Chaplin, Stephen Crane, Helen Keller and Eugene Debs. By 1902 its circulation reached 150,000, making it the fourth highest of any weekly in the United States. 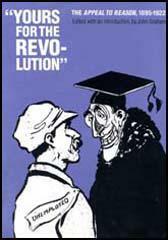 According to John Graham, the author of Yours for the Revolution (1990): "During political campaigns and crisis, copies of single issues reached 4.1 million - a world record... The Appeal succeeded at a time when millions of people spoke of the cooperative commonwealth with hope, expectation, and meaning." In 1904 Fred Warren commissioned Upton Sinclair to write a novel about immigrant workers in the Chicago meat packing houses. Wayland provided Sinclair with a $500 advance and after seven weeks research he wrote the novel, The Jungle. Serialized in 1905, the book helped to increase circulation to 175,000. When published by Doubleday in 1906, the novel was an immediate success. Within the next few year it was published in seventeen languages and was a best-seller all over the world. In 1905 William Haywood (general secretary of WFM) and Charles Moyer (president of WFM), were both been kidnapped in Colorado and taken to Idaho to stand trial for the murder of Frank R. Steunenberg, the former governor of Idaho. This upset Warren as a few years earlier the authorities had refused to arrest and charge William S. Taylor, the former governor of Kentucky, with the murder of the progressive politician, William Goebel. Taylor fled to Indiana where he became a wealthy insurance executive. Julius Wayland and Fred Warren were once again in trouble in 1911 when they published a series of articles in the Appeal to Reason about corruption and homosexuality in Leavenworth Prison. Although senior figures running the prison were dismissed, Wayland and Warren were charged were charged with sending "indecent, filthy, obscene, lewd and lascivious printed materials" through the post. 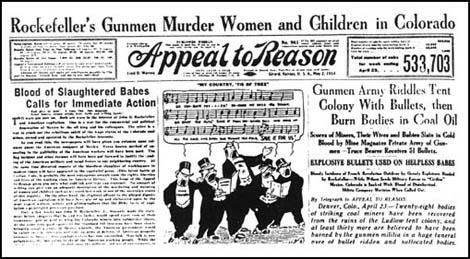 As the popularity of the Appeal to Reason increased, so did the attacks on Julius Wayland and Fred Warren. The paper's offices were repeatedly broken into in an effort to find evidence of criminal activity. Research was carried out about Wayland's ancestors and reports in the Los Angeles Times claiming that they had been involved in cases of arson and murder. In 1912 the newspaper reported that Wayland was guilty of seducing an orphaned girl of fourteen and who had died during an abortion in Missouri. At the time of his death, Appeal to Reason was selling 500,000 copies a week. The following year circulation reached 760,000. However, the new owner of the journal, Walter Wayland, fell out with Fred Warren. In August, 1913, Warren resigned and Louis Kopelin became the new managing editor. Wayland, unlike his father, was not a committed socialist and sold a third of the journal to a wealthy banker, Marcet Haldema-Julius. On the outbreak of the First World War the Appeal to Reason opposed America's entry into the conflict. This was also true of most journals in the United States but after the USA declared war on the Central Powers in 1917, the journal came under government pressure to change its policy. This became more of a problem after the passing of the Espionage Act. 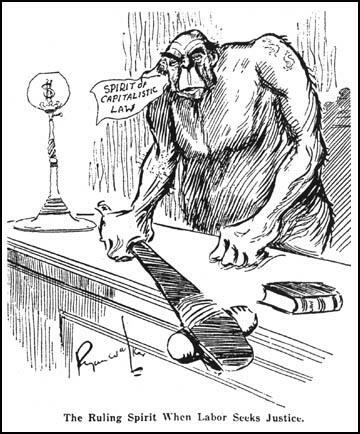 Under this act it was an offence to publish material that undermined the war effort. Other radical papers such as The Masses decided to cease publication but in order to continue, Louis Kopelin decided to support the war. After the war, the attorney general, A. Mitchell Palmer, became convinced that Communist agents were planning to overthrow the American government. Palmer recruited John Edgar Hoover as his special assistant and together they used the Espionage Act (1917) and the Sedition Act (1918) to launch a campaign against radicals and left-wing organizations. As a result of this Red Scare people became worried about subscribing to left-wing journals and sales of Appeal to Reason fell dramatically. Walter Wayland, who had no strong interest in politics or publishing, decided to cease publication in November, 1922. In the midst of plenty you are starving. In the midst of natural wealth and mechanical means waiting idly for the had of Labor many of you are deprived of employment, while those of whom work is given must toil increasingly for a decreasing pittance. The more you produce the less you get. Why. Simply because the plenty of your own creation, those machines of your own make, and nature itself, the common inheritance of men, have been appropriated by a class - the capitalistic class. That class, which you have enriched, keeps you in poverty. That class, which you have raised to power, keeps you in subjection. With the introduction of private ownership in land came the period in the history of the human race when some man by reason of his superior strength or cunning, or some group of men, by reason of greater numbers, took possession of the land being used by another group and made slaves of the latter. If men understood that the land is one of the great natural resources on which life depends, that it is the natural heritage of all men, and not a few, and it was so recognized through the long ages of savagery and barbarism, and that no title deed was recognized until civilization, so-called, made its appearance, I believe few would be willing to submit longer to the tyranny of the landlord and the master. The Appeal is an agitation sheet - that and nothing more. I am an agitator. The propaganda of Socialism is my specialty. More than a decade ago I resolved to lend myself to this work to the best of my ability. The work of organization I left to others - to the rank and file - because it's not in my line. I have no desire to be other than a private in the party, counting just one. I have repeatedly refused to accept even a local or state office - and have used my influence to prevent anyone connected with the Appeal becoming identified in an official way with the state or national organization, in order to leave the Appeal unhampered in this pioneer agitation work. (7) In October, 1908, Mary Mother Jones wrote about child labour in the socialist journal,Appeal to Reason . The article dealt with the factory owner, Braxton Comer, the Governor of Alabama who owned a large textile mill near Birmingham. One woman told me that her mother had gone into that mill and worked, and took four children with her. She says, "I have been in the mill since I was four years old. I am now thirty-four." She looked to me as if she was sixty. She had a kindly nature if treated right, but her whole life and spirit was crushed out beneath the iron wheels of Comer's greed. When you think of the little ones that his mother brings forth you can see how society is cursed with an abnormal human being. She knew nothing but the whiz of a machinery in the factory. The wives, mothers and the children all go in to produce dividends, profit, profit, profit. The brutal governor is a pillar of the First Methodist church in Birmingham. On Sunday he gets up and sings, "O Lord will you have another star for my crown when I get there?" I believe in the confiscation of the productive property of this nation by the working class. I do not believe in confiscating it by piecemeal. That would be foolish and illegal. The plan I favor is that the working class shall first capture the political powers of the state and nation and then the job can be done without the danger of getting cracked skulls and prison sentences. This is the plan followed by the master class. It has been proved a success by the master. It will prove a workable plan for the slave. The mission of the Appeal to Reason is to persuade the men who work to use their political power that it may be possible easily, quickly and without opposition to exert their individual strength. I believe the working class should capture the political powers of the cities as rapidly as possible. I presume that the Socialists and laboring people of the Allied and neutral countries are mainly interested in knowing whether official Washington speaks the minds and hearts of the Socialists and laboring people of this country. In your countries, governments have been known to gauge wrongly the wishes of their peoples. Naturally you wonder how a peaceful and progressive nation such as the United States would voluntarily enter the world conflict and carry out the far-reaching program of military participation it has set out for itself. You have unquestionably been told by agents of the Central Powers that our government will not carry out its program because it has not the working people with it. This is told to you in order that you may be discouraged as to the possibilities of a victory for the cause of democracy. Our people favor the war. Organized labor favors the war. The majority of the American Socialists favor the war. All the liberal and progressive organizations favor the war. It is true we have a few pacifists and objectors. But they are so few that they are negligible. From the very beginning organized labor came out frankly and fully in behalf of America and the Allies. In fact our trade unions through their accredited representatives took this stand a month before the formal declaration of war against Germany.